I watch cycle races. I don't often take part, except for charity rides. I find out which cycle races are happening through cyclingfans and cyclingnews and then follow them by satellite tv or live web coverage which I'll describe below, as I find it. I'll post more times next week. I'd bet on a strong showing from Caisse d'Epargne after a relatively quiet TdF. Who would you tip? If you've not got your satellite set yet, some Lidl specials are still available and most Maplin branches have sets. Finding the broadcasts at 19 east is pretty easy in the UK. See my asteFAQ for hints and links. I've still not fixed my dish up properly, yet it gets most 19 east transmissions. 2007-08-19 (Permalink): NDR are broadcasting the Hamburg Classic in DVB (digital) and PAL (analogue) at 19 east at 11-14 GMT today, while ARD at 19 east and 13 east overlaps from 12.30-15.00 GMT, presumably including the closing stages. Notably, this race has excluded Tour de France winner Contador, apparently as well as everyone else even mentioned in connection with the Fuentes affair. Yesterday's last stages of the Burgos and the Deutschland-Tour seemed surprisingly unsurprising, with Juan Mauricio Soler and Jens Voigt kept their respective leads. 2007-08-16 (Permalink): Eurosport are broadcasting the Vuelta a Burgos at 19 east until Saturday. This can be an interesting race for seeing how well the ProTour teams are recovering from the Tour de France, ready for the Vuelta a España. Barloworld's TdF revelation Juan Mauricio Soler has a 17-second lead into tomorrow's individual time trial. The 69th Volta a Portugal finished yesterday with an ~50-minute individual time trial that saw the lead change hands and Xavier Tondo of LA/MSS take the General Classification by a little under a minute. RTP's coverage was strangely subdued. It seemed like they only had cameras around the finish line, not on motorbikes following the riders. The bad weather may have caused that, though. Meanwhile, the Deutschland-Tour 2007 is broadcast to Europe until Saturday on ARD at 19 east and 13 east. Gerald Ciolek of T-Mobile won his second stage in a row today, while CSC's ever-popular Jens Voigt remains in yellow. Individual time trial there too tomorrow. ARD's coverage has been very swish so far this year. Widescreen with informative graphics, although the commentary is still a bit subdued for my taste. Overall, it's a shame there's not more airtime given to it. 2007-08-11 (Permalink): The Deutschland-Tour 2007 is broadcast to Europe until next Saturday on ARD at 19 east and 13 east. After a wet start, Gerolsteiner's Robert Förster is leading them into today's team time trial, but it's only the second stage. The 69th Volta a Portugal is broadcast worldwide until next Wednesday on RTP Internacional and RTP Africa at all sorts of satellite positions. Candido Barbosa of Liberty Seguros (yet another cooperative cycling sponsor ) leads, but the advantage is small. 2007-07-26 (Permalink): OK, this is probably my last Tour post for a while... back to business, software and the village after this, but I heard this on the radio over breakfast and I can't see much about it online. One of the most disappointing things for English Tour fans about Moreni's failed dope test [tdfblog] is the departure of his Cofidis team-mate Bradley Wiggins from the race, days before the last (and most Wiggins-winnable) of the individual time trials. "We've had whole teams withdrawing. It's not just the two who test positive. It's the sense that those are the tip of an iceberg, isn't it? The whole team pulls out and you don't really know how many others in that team are affected by the same behaviour." "Well, I mean, the fact that the whole team pulled out is something which the UCI is quite annoyed about, in actual fact, and it was that the organisers asked the teams to pull out. It wasn't the fact that the teams pulled out of their own accord. The organisers said to them, as a result of the positive, that they got the one person and they said they want the whole team out of it. That actually goes against the rules and it shouldn't have happened. Erm, so, from that point of view, you can't put anything on the other riders. You can't say that the other riders are up to anything just because they're not in the race. They were asked by the organisers to get out." The interview continues to point out how there's much more testing in cycling now than ever before, and more than in any other sport (remember, Puerto implicated footballers and others too), but it's interesting how the whole-team-out approach is criticised for removing the other riders on a team from the race testing! Anyway, by the UCI president's reasoning, Bradley Wiggins should still be racing. Well done to UCI and the tour for catching Moreni and almost-well-done to Moreni for admitting it, but boo Cofidis for pulling the whole team out! "You seem to have forgotten that cycling is a team sport. If one of the team are using drugs then the other team members are presumably gaining an unfair advantage from riding with them. If they are not, then what is the point of teams in the first place?" I think it's unlikely most team members got any advantage from riding with dopey cyclists like Moreni or Vinokourov, don't you? Vinokourov was clearly the team leader and his team-mates were put to work for him, even if it harmed their chances of victory. Most memorably, Klöden dropped back to help leader Vino try to catch the pack. Moreni's a trickier question. I didn't see much of Cofidis this year apart from the individual escapes and time trials. Did he work for the team or his leader much? I can see an argument for kicking out the team leader if a teammate dopes, but not the whole team. Let the "headless" teams continue: it would make the later stages more exciting (because riders on those teams would have nothing other than stage wins to race for), it would mean more dope tests for the rest of the team and it would serve as a reminder, on TV every day, whose dopey riders got caught. "Audience in Spain will keep on raising while Contador keeps playing such a big race!" I hope that's still the case after the recent revelations. The evidence suggests that Vinokourov had someone else's blood [tdfblog] and Cofidis's Moreni was using something like a nutsack patch [tdfblog] while Rabobank have fired race leader Rasmussen for telling them he was in Mexico when he was in Italty [tdfblog] so it looks like this year's race is still really unpredictable as the dopes are caught and kicked out. 2007-07-17 (Permalink): Did you know that the cooperative movement has a strong presence in le Tour? Road cycling is a good sport to show off teamwork and cooperation, because no-one can win a three-week tour on their own. Top-placed cooperative rider is Rabobank's Michael Rasmussen, the General Classification leader! He's also currently King of the Mountains (polka dot jersey) and Most Aggressive Rider (red numbers). We've already seen C.A's Thor Hushovd win a stage, while Milram's Erik Zabel has led the points classification and now lurks in second in that contest for the green jersey. Both Caisse d'Epargne's Alejandro Valverde and Rabobank's Denis Menchov should have a chance of the overall win - or can Michael Rasmussen keep it despite the time trials to come? 2007-07-10 (Permalink): I'm back from watching the Tour de France stages in London (actually, I was back yesterday, but was straight out the door to CoopSW - more on that soon). It was pretty damn amazing, with far more than the expected 200,000 spectators on the Saturday alone. We started in Green Park, but it just got silly there - couldn't see a damn thing - so we plodded through to Hyde Park and stood about 10 rows back on the top of a bank where we could see both the course and a big screen. Excellent contest, but Kloeden and Cancellara were disturbingly fast. After a thoroughly surreal overnight stay in a hotel in Canning Town (yes, surreal: I'm sat there eating breakfast and a giant stick figure goes past the window at 30mph - it was damn Champion supermarkets caravan float), I went and stood on the roadside near km0 in Greenwich. Again, an amazing turnout. Every available vantage point was occupied. As well as being between 4 and 6 deep at the barriers, people were hanging from nearby railings, perching on top of stone pillars - and it seems that London bus shelters will support at least 8 people on the roof. I then took the DLR and Jubilee line back to Hyde Park, saw a bit on the big screen and caught the train home. I took tons of photographs, but used the film camera, so I'll wait for them to return from the developers. I'll watch the rest of the race on TV. 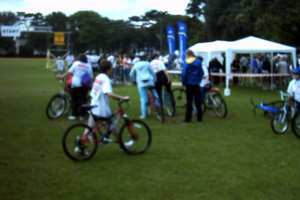 2007-07-18 (Permalink): It seems to be carefully avoiding Weston (scared of The Kaiser Chiefs perhaps), but The Bicycology Bikeride 2007 will call at Bristol this weekend and Yeovil on Tuesday, before finishing in Exeter next weekend. 2007-07-04: Bristol is my nearest big city. Its council is told by government to cooperate with ours, but I'm not sure that's a good idea for cycle facilities. They build some good on-road stuff, but some of their other stuff seems just plain insane. Now rider md451, who brought us a video of a ride along the Coronation Road shared-use farcility, has posted a picture of Bristol's "densest white paint in one cycleway" award-winner. Winters Lane in Redhill is shutting for two months while a new sewer is put in." Pipe works seldom seem to take up the full width of the road and the Herluin Way cycle track only crosses Herluin Way at a few points. Will these roads be kept open for cycling? They should be. All of these seem to be starting just before next week's Cycle Forum (7pm Wednesday 10 January at Worle Campus, press release ). Interesting new year present. While I was away, Jam-Busting June started. It's one of the biggest commuter challenge events in England. I took part in King's Lynn's event last year, but this one has a prize draw too, so go for it if you're in the WsM area. Things are already in good shape here, as you can see from the hotspots in both WsM and Bristol on this Census-based map. Wednesday, June 6 - meet at The Campus - 8am. Wednesday, June 13 - meet at Worle Railway Station - 8am. Wednesday, June 20 - meet at Ebdon Cemetery - 7.30am (to the seafront for a free breakfast - cyclists can also make their own way to the café). Wednesday, June 27 - meet at Weston General Hospital - 8am." Maybe see you there. Their homepage also has a preview of the new Strawberry Line leaflet and the 2007 route map will be up in due course. I used to live in Norfolk, so Norwich Evening News: Was top cyclist killed by driver asleep at the wheel? (Updates: EDP: Death crash trial hears of "most viable explanation" and EDP: Driver guilty of causing cyclist's death ) and Norwich Evening News: Cyclist hit by bus on A47 are rather worrying. The comment about the road being dangerous because of a lack of cycle track sounds like a misquote or misunderstanding. The road is dangerous because car drivers aren't driving within their ability. Adding a cycle track won't change the road: if the driver really was blinded by low sun and driving beyond their ability, they could easily have strayed into a cycle track. Also, roadside cycle tracks are often kept to a damned sight worse standard than the roads (often 18mph top unladen speed on wide tyres - less if you're carrying or on road tyres) so end up being no safer in total. I saw the Flax Bourton greenway consultation (available on http://www.n-somerset.gov.uk/Transport/Travel/Cycling/flaxbourtongreenway.htm) includes a railway bridge with what looks like a maximum-radius corner on one side, but a tight corner emerging from behind a fence on the other. I wonder whether there's any reason for that, because it looks dangerous to me. Check Sustrans plans carefully. On one hand, they've got the money and planning authority respect to get dumb stuff built, but on the other hand, they've got the money and respect to get good stuff built. Use 'em. The Joint Local Transport Plan: How the forum may maintain pressure to implement cycling benefits in the plan? "Your right to ride on the road is in jeopardy. The revised Highway Code says cyclists should "use cycle facilities where possible". [...] The implications of this are bad. First, we will suffer more abuse and intimidating driving. Secondly cyclists will be disobeying the Highway Code when they assess that a cycle lane or path is dangerous and act accordingly. Thirdly, if a cyclist is involved in an accident and tries to claim damages, the insurance companies are likely to argue that the rider contributed to the accident by not using the cycle facility. There is a petition on the government website. One can be sceptical about the value of these petitions but the publicity is valuable as can be seen from this Sunday Times article of 7 May. It is interesting to note that 35 MPs objected to the original revised wording. Unfortunately, the replacement wording is worse. 11,000 objections were received to the previous wording. There are 70, 000 in the CTC alone who should now be objecting. If this Highway Code is approved by government cyclists will effectively lose the right to ride on the road where there are alternative routes or adjacent facilities. Please register your name on the petition and persuade others to do the same." More developments on cycling and the Highway Code: There was a written answer in parliament about the Highway Code which completely avoided the question - cyclists are voting 'no' to its 'Does this answer the above question?' poll. I have. bikeuser wrote about the Highway Code with excerpts and links to me and also linked Eleanor Blair - More Highway Code which mentions the Early Day Motion in parliament with a suggestion that you write to your MP and ask them to sign it. "I agree with you that cyclists should have the right to decide that a cycling road seems too hazardous. However, other than that, any reason why cyclists should get to use roads when cycle paths exist?" Yes. The most important reason is that most cycle paths are built to a very low standard (design speed of 18mph on an unladen hybrid bike) which is unsuitable for commercial carriers and even ordinary road bicycles (what I used to call racers). Even national government suggests to use the road if you want to exceed the design parameters of cycle paths. "As a general rule, if you want to cycle quickly, say in excess of 18 mph/30 kph, then you should be riding on the road." Also, cycle paths usually get the lowest priority of all highways at every junction (contrary to national guidance) and are hopelessly badly signposted. Would you choose a bumpy-road that gives way at every piddling side road when you have the choice of a flat, smooth A road? I doubt it - that's the basic form of traffic calming in bypassed villages like Blisworth. There are some cycle tracks I use, but even those are so badly signed, it's taken me weeks to figure them out - and I've been visiting family in this area for years! For example, I don't enjoy riding on the exposed Somerset Avenue dual carriageway and the adjacent purpose-built shared-use path is segregated, with few junctions or pedestrians, but consider the junction complex at West Wick (the aerial picture shows the cycle path, but the roads on the bottom right have changed). It's faster to use the underpasses, cross Churchlands Way into Yew Tree Drive and then use the Summer Lane underpass to reach North Worle, but which way do the cycle route signs send you? Yep, round to the left, across four sets of traffic lights where the cyclists get the lowest priority (and a 'Cyclists Dismount' sign for good measure) and then along a path that level-crosses an estate road completely blind (under construction in the aerial pic, above the roundabout). Oh, and the cycle route map's wrong for that area, just to make it even more confusing. Because of the bad signposts and maps, it's also very difficult to report any problems with cycle paths and tracks to the highways maintenance team. Cycle paths often don't have names and I've sometimes had reports come back with "there is no fault" when it turns out they've looked at the nearby road, not the cycleway. The bigger question is "why is so much money spent on the cycling equivalent of B-roads?" and I don't know the answer to that. We would do much better to widen roads to add cycle lanes (or allow safe in-lane overtaking by cars), instead of widening the adjacent paths and painting them as shared use. On Sunday 20 May, I rode in the Leukemia Research Weston-super-Mare Bikeathon which "has so far raised in excess of £120,000 for the charity." I finished the course of about 23 miles in a bit over 2 hours. That was slightly slower than I expected, but I hadn't anticipated the batched mass start (20 riders set off every 30s or so) and the relatively slow speed of the large group ride to the first hill where the short course filtered off. I wasn't the fastest or the slowest by a long way. The first hill, Bleadon Hill, was new to me and it was a bit of a pain. It was rideable, unlike the hill nearest me, but it continued upwards at a challenging gradient for a long time. I'd estimate it's about 4km and mostly over 5% - I'll not be riding it again in a hurry. The view from the top was almost worth it (even if it didn't photograph well, looking almost south at 11am) but then you remember that you've just ridden up there from sea level and everything aches. Getting down from that hill was also fun. The descent was through Canada Coombe, which looks about 10% down for about 1km and it's a narrow uneven road with loose gravel washed onto the road. Then it was a fairly direct link north to Locking and Worle, a flattish loop from the crematorium to Ebdon, Bourton, Icelton and Wick St Lawrence (which felt good, like I could ride it forever - it's amazing how easy a well-tuned bicycle feels) and back to town via Sand Bay and Kewstoke. 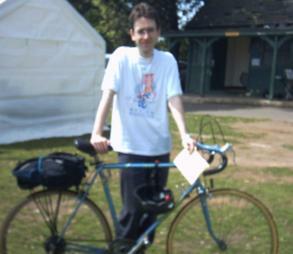 The picture is of me outside the pavillion at Clarence Park, just after finishing. The pack contained repair kit, water, food, rain gear and extra top, none of which was needed. I didn't pack sun block or insect-repellent, which would have helped (although thankfully not vital)! Thanks to everyone who sponsored me. If you still want to contribute, please put it in the comments form with an email address, and/or email me directly. £10k. That's a great result! I think I'd do it again and I think the initial hill has its uses - it's a bit of an unusual challenge and strings the field out. I didn't have any congestion problems until the first checkpoint after we merged with the short route. If you're looking for changes, I'd put that Somerset Avenue checkpoint somewhere with more space and reroute a quieter way around Worle, maybe up Walford Avenue with the split to the Ebdon loop at Riverbank. UKeventphotos.com only shows me the first page of the gallery - clicking "Next results" dumps me back at the search front page. I think they need to learn how to make accessible web sites (my work offers advice...). I'm glad I took my own camera and I'm sorry if their bad web site limits the amount LRF gets from photographs. "Thanks for the advice, your comments on the route match those of a couple of others so I think we will go ahead and make those changes but keep the hill of pain! I will ride the revised route this weekend to give it a go." While you're out there... I heard some comments that Windwhistle Lane on the short route wasn't very easy to follow, but I suspect that's more a problem with the council's (lack of) signs than a bad route. I didn't find the black-and-white bikeathon signs easy to spot on the faster/busier stretches. The pink and the yellow(?) ones were usually easily noticeable. I wonder whether the first black-and-white signs were at Worle Moor Gate - I went so wrong there that I rode up to the marshals at Summer Lane/Diamond Batch from behind! "On the photo web site, you can get access to a total of about 700 pictures but it's not immediately obvious how. Mind you I can't criticise - the http://www.lrf.org.uk site is even less user friendly. We have photos on it of local people getting out there and doing great things to raise money but you try and find them its like wandering the catacombs. We need our own simple West-country site! Have a look and comment if you want, an experts critic is well overdue." Well, the LRF site isn't bad - it needs to sort out its colours and contrast, and the text alternatives to images seem to be nonsense like asterisks, but I think I can actually access all of the pages without trouble. If you'd like a westcountry site, contact me at work and I'll offer a deal. "Anyway back to photos. Get onto the one page of photos it will let you see and then click "refine search." This will take you to the menu as follows... Start Childrens Race Bleadon Hill Finish 1 Finish 2 Finish 3 Finish 4"
I can see more photos that way, but still only the first 8 from each category. The Redways: a few bad apples? There are 1988 http://www.cyclecraft.co.uk/digest/redway.html and 1989 papers http://www.cyclecraft.co.uk/digest/2decades.html by Cyclecraft Author John Franklin http://www.cyclecraft.co.uk/ about poor accident records of the Milton Keynes Redways http://www.mkweb.co.uk/cycling/ which are often cited by cyclists as showing why cycle facilities are dangerous or "farcilities". But I grew up riding the Redways and I think the closest I came to seeing a Redway-caused injury was when we accidentally rode onto an under-construction stretch by mistake and met a road roller. I journeyed to work all the way along the north-west edge when I was employed in that area one summer. (The cross-city Redway I used was fairly quiet on the journey to work around 0700 but quite busy on the return - looked like "school run" traffic.) I lived three miles from the MK boundary for a decade and so I've had some time to think about this. I consider condemning the Milton Keynes Redways as dangerous farcilities is simplistic and misguided. Here's why: Milton Keynes was one of the first English cities to have cycle routes designed in from day one. This means that there are cycle tracks of types and in spaces that we hadn't seen before. Where else did you get a network of both low-friction surface high-speed cycle routes with sweeping bends and grade-seperated junctions and connecting routes to every estate? How many places have that added since? Almost nowhere. Milton Keynes is a massive cycle track experiment. As Franklin notes, that experiment didn't go completely to plan and the "secondary grid" of Redways between district centres simply isn't there. Nevertheless, there are things that work amazingly well, but there are others which are now obviously stupid, like not protecting the sight lines at juctions of the connecting routes and putting late-80s estate routes alongside feeder roads, where they have more frequent and busier level junctions. I think some of the London data also suggests that the non-separated junctions are the most dangerous places, which suggests that Milton Keynes is not a cycle track promoter's perfect design in the first place. The unique Redway network was built in several phases. To be fair, I can't recommend the original network for anything other than low-speed connecting use, but the addition of the straighter cross-city routes (the "cross-city Redways" mentioned in the 1998 paper and my introduction) to the original plan early last decade improved matters immensely. Although the different types are mentioned in the introductions, this difference seems entirely ignored by the accident data, which is my main complaint against the papers. There's no way of comparing like with like, as far as I can tell. You can split the accident data for NSL grid roads from the link roads and estate roads, but you can't split the long-distance Redways from the local estate Redways. Based on my years cycling around the city, I expect that the difference between grid Redways and grid roads is pretty small and that local Redways are *far* worse than local roads, but I can't prove or disprove that from his data. None of the studies I've seen differentiate between construction phases or route types, which is like only having combined accident figures for the Fosse Way and the M5. My second complaint is that I don't trust the use estimates in these papers. I noticed cycle counters (sensor loops cut into in the path, attached to a grey cabinet with solar panel) scattered around King's Lynn, but I don't remember any in Milton Keynes. Milton Keynes Redways and Leisure Routes: An Information Sheet http://www.cyclecraft.co.uk/digest/redway.html includes phrases like 'It is evident from casual observation...' while noting the combination of this with other data suggests a 'paradox' - maybe there's no paradox and the casual observation is simply incorrect? The main source of cycle use data seems to be surveys rather than counters. A survey with 120 responses has quite some potential for error estimating a city of 200,000 people. An "accident rate" equals "accidents per use", so an incorrect use estimate can make a very big difference, especially if use is still sadly small. As the author says, he has no accurate usage figures for the Redways. A survey is included in the references, so I find it surprising that no usage information is quoted from that survey. Perhaps it would help to explain the figures in some way unwelcoming to the general tone of the piece? Cyclist preferences seem to be taken from one cycle user group screenline count, rather than a cordon census or survey, which I also found surprising. Even with the above problems, this seems to be the best that could have been done at the time. I think we need to push for better cyclist data, so we can see what the problems actually are and whether any of the conflicting theories can be supported properly. Personally, I'd do it by comparing like with like. Safety audits and accident data for equivalent routes should show which is safer. I quite expect the totality of cycle tracks in an area to be less safe per user unit distance than the totality of roads in an area - there are some real stinker cycle tracks out there, in most towns, often built by non-biking local authority design consultants, and corrections for bad cycle tracks are not done as quickly as corrections for bad roads. The breakdown of causes of accident in Franklin's papers is interesting. The vast majority of accidents are caused by inadequate design, probably as a result of travelling at high speeds along the local routes which weren't really designed for speed. Some suggest occasional bridges as the best solution, but in my experience that has all the disadvantages of a dedicated network (more so in the case of litter and debris) plus a steep incline, but none of the benefits. That's something we could learn from the Redways - how to maintain and how not to maintain cycle tracks. Another thing we could maybe learn is the importance of enforcement. Enforcement of traffic rules on the Redways used to be nigh on non-existant and those are education and enforcement problems, so it's roughly what I'd expect. At one point, there was some confusion which laws applied: Highway Code or local footway bylaws. We could also learn about ownership and promotion. Responsible cycling *and* responsible cycleway use (for example, it only takes a few seconds to move debris off the main track) are essential to its success. After MKDC stopped issuing the redway maps and code for free (1992, I think), there was a noticeable decline. So, while the MK Redway network isn't perfect, it's a long way ahead of the facilities offered in most cities. We should learn from any successes and failures we can as we add cycle route networks across the country, using roads, lanes and tracks as appropriate. It is foolish to condemn all car-free tracks because a big experiment wasn't 100% right first time, especially as the Franklin papers don't give enough detail to see what went wrong - for all we know, it's the sorts of mistakes that are at least as possible on the roads, like bad junction design.